Lush and simple. Our Kentia Palm in a tall warm-white pot. 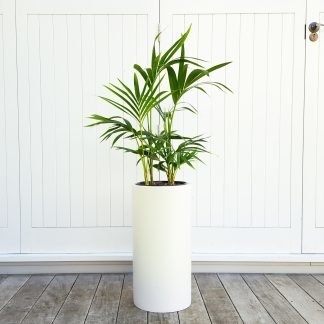 We’ve paired this palm with our warm white Pillar Pot which has a matt stone-like surface. It is made of lightweight mineral-fibreglass composite. Pot dimensions: 30cm diameter x 60cm tall. Dimensions including plant: 50cm wide x 120cm tall approximately.